Despite seeing previews for a month, I really had no idea what GOOD TIME was going to be about. But it looked interesting and had received some prestigious awards and nominations, including a Palm d’Or nomination at Cannes. Ok, that was enough to motivate me to drive through a rare Los Angeles summer rain storm to see the film. It was worth risking my car on a wet freeway. GOOD TIME is a heist gone wrong movie on the surface. But the film has layers. Brotherly love. Family angst. Desperation to do better. And a helluva performance by Robert Pattinson (yes, from the Twilight films). Pattinson and co-director Benny Safdie are the Nikas brothers, Connie (Pattinson) and Nick (Safdie). Nick is developmentally disabled. Connie is some kind of low level criminal who decides to rob a bank with his brother’s help. His motivation seems to get Nick out of New York to the country (Virginia). the heist seems to go off without a hitch, but the brothers are quickly found out and run. Nick is captured, but Connie keeps running. The rest of the film involves Connie trying to get Nick out of jail so they can get out of New York. Whether that is trying to con his much older girlfriend (Jennifer Jason Leigh) out her mother’s money to pay a bail bondsman, or trying to break Nick out of a prison ward in a hospital, Connie is desperate to make things work. But, no plan works. Obstacles are everywhere. Every turn is another roadblock. As the minutes and hours go by, you feel the growing desperation. This is a meaty role for Pattinson and makes a meal of it. You can see the wheels constantly turning behind his darting eyes and frustrated grins. He is determined and focused despite everything. It’s easy to portray this character as unsure or filled with doubt. But Pattinson’s unwavering focus allows the audience to believe that he might just pull off this whole thing. Sorry, no spoilers about whether he does or doesn’t. The Safdie Brothers have done a lot of documentaries and shorts. This is one of their first full length dramas. You would never know it. Their chosen style here is gritty and dark. The spit and polished New York is nowhere to be found. This looks like New York of the 1970’s. The French Connection New York. The New York where the city is a character. 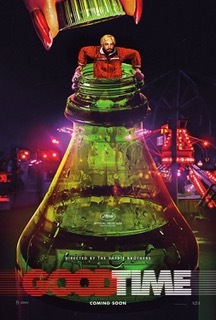 GOOD TIME is a tight 100 minutes of adrenaline fueled desperation that works on every level. I look forward to what Josh and Bennie Safdie do next.